SCVHistory.com LW2067 | Film-Arts | Gene Autry in 'Tumbling Tumbleweeds,' Republic 1935. Gene Autry's first feature for Republic Pictures Corp. was "Tumbling Tumbleweeds," filmed in 1935 at Trem Carr's Western movie town in Placerita Canyon (later part of Disney's Golden Oak Ranch). 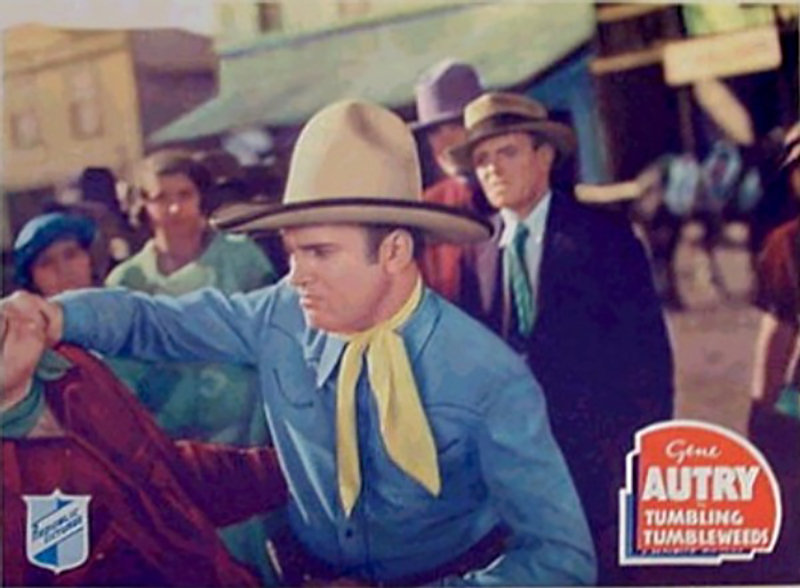 Autry is seen here in this lobby card in front of some of the wooden buildings, which Hickson would move a year later to the corner of Oak Springs and Placerita Canyon Road. Hickson would lease the town to Republic's rival, Monogram Pictures, and the town came to be known as the Monogram Ranch. In 1952, following Hickson's death, Autry purchased the movie set and renamed it "Melody Ranch." In 1962 the buildings burned down as a wildfire consumed the canyons surrounding the Santa Clarita Valley. Autry sold off the property in pieces; Paul, Renaud and Andre Valuzat picked up the 10-acre area where the buildings were located and rebuilt them off of old photographs. LW2067: 9600 dpi jpeg from smaller jpeg. Online only.